Fuel costs were an inevitable concern for Cheese Cellar, twenty years ago, when it was a small company running a single van. The wholesaler/retailer of cheese and speciality foods is now a £70 million business, employing almost 300 people, with customers throughout the country. With a distribution fleet operating from depots in London, Worcester and Manchester, it still needs to keep close control of fuel costs. The Cheese Cellar’s Texaco Fastfuel fuel card is also accepted on Tesco, Morrisons and The Co-operative supermarket forecourts, as well as at Moto service stations. 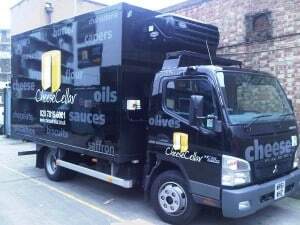 This gives their drivers fast, simple refuelling at more than 2,000 locations throughout the country. Detailed, customised reporting is readily available for download into standard office packages and Cheese Cellar has secure 24/7 access to complete account information fleetwide. That includes the latest refuelling transactions, yet to be invoiced. Cheese Cellar’s success owes much to its commitment to providing quality products backed by excellent customer service – and that, as Andy Herbert is happy to confirm, is exactly the treatment that Cheese Cellar enjoys from Fuel Card Services.